Samali is a traditional Greek semolina dessert, flavoured with mastic and drenched in syrup. Some blanched almonds are used to decorate the cake on top. This Lenten or vegan version of this dessert is a twist to a recipe I used to make in the restaurant called Samali or Kalon Prama in Cyprus, which we offered to our clients after their meal free of charge. This time of the year we have a lot of mandarins in our yard so I made the syrup using mandarin juice. If you like you can substitute it with orange juice. The mastic powder is what gives this dessert its distinct flavour. I used some of the mastic I ground over 8 months ago and although mastic crystalizes, the method I used to store it keeps it perfect for months. In this dessert apart from the mastic you can also sense the flavour of coconut. Greasing the baking tin with tahini or tahini with carob syrup is optional but it adds additional flavour to the cake. In order to make the dessert richer I decided to add some vegan whipped cream on top. I used coconut cream and I was surprised to see how well it holds together and if you like the taste of coconut, it is superb. If you want to skip the whipped cream, you can decorate the cake with blanched almonds before baking it, as in the traditional recipe. The strawberry sauce is also optional but if you do add the whipped cream it goes well with the dessert. You can find more Lenten or Vegan Recipes here. 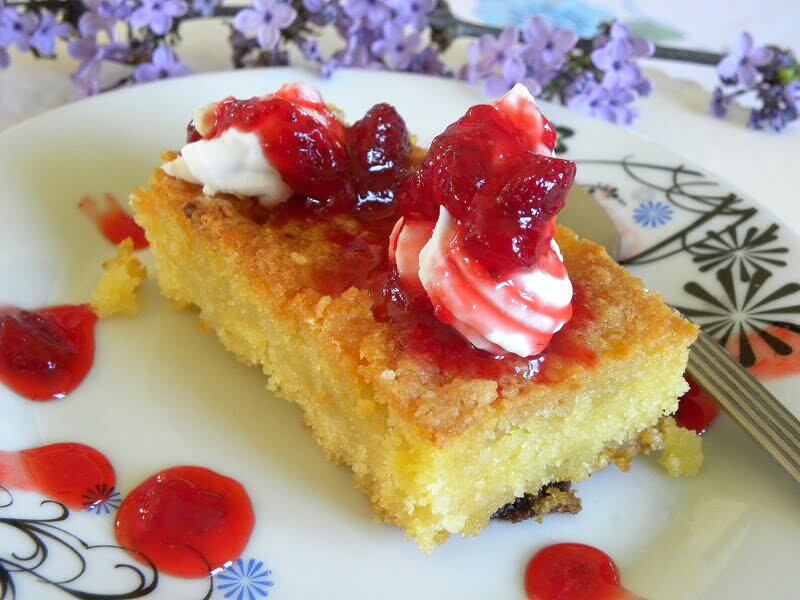 Samali is a traditional Greek semolina dessert, flavoured with mastic and drenched in syrup. Put the coconut cream in the fridge the night before. Put all the syrup ingredients in a small pot and boil for 5 minutes. Set aside to cool . Mix the semolina together with the sugar, baking powder, the zest and mastic powder. Add all the liquid ingredients and mix well . Allow the mixture to sit for 2-3 hours covered . Mix the tahini with the carob syrup and coat a baking pan measuring 32 x 23cm (12 1/2 x 9 inches). Spread the cake in the pan and bake in a preheated, moderate oven to (160 ° C) until golden brown , about one hour . Pour the syrup on the hot cake and leave it to cool and absorb the syrup. Prepare the Vegan Whipped Cream. Decorate the cake as you like. Serve with strawberry sauce (optional). This looks wonderful! A very nice twist on the traditional Samali. I never thought of putting coconut whipped creme on it (tho I do use it for other desserts). Kalo Pascha!